Motto: "One people, one nation, one destiny"
Anthem: "Dear Land of Guyana, of Rivers and Plains"
1 Around one-third of the population (230,000) live in the capital, Georgetown. Guyana, officially the Cooperative Republic of Guyana, is the only English-speaking country in South America. It is also one of four non-Spanish-speaking countries on the continent, along with the Brazil (Portuguese) and Suriname (Dutch) and the French overseas region of French Guiana (French). Culturally it is more associated with the Caribbean than with Latin America. Guyana is the third smallest country on the mainland of South America. After decades of socialist policies that resulted in a deteriorating economy, a turnaround was made by a reform program begun in 1989 that significantly reduced the government's role in the economy, encouraged foreign investment, enabled the government to clear all its arrears on loan repayments to foreign governments and the multilateral banks, and brought about the sale of 15 of the 41 government-owned (parastatal) businesses. Guyana is an Amerindian word meaning "Land of many waters." The country is characterized by its vast rainforests dissected by numerous rivers, creeks, and waterfalls, notably Kaieteur Falls on the Potaro River, which at 741 feet is the world's highest single-drop waterfall. The country enjoys great diversity of both cultures and flora and fauna. Guyana's main mountains are in the south, including Mount Ayanganna (6,699 ft; 2,042 m) and Mount Roraima (9,301 ft; 2,835 m)—the highest mountain in Guyana on the Brazil-Guyana-Venezuela border, part of the Pakaraima range in the west. Roraima is said to be have been the inspiration for Sir Arthur Conan Doyle's novel The Lost World. There are also many steep escarpments and waterfalls, including the famous Kaieteur Falls, five times higher than Niagara Falls. Between the Rupununi River and the border with Brazil lies the Rupununi savanna, an ancient lake bed, south of which lie the Kanuku Mountains. There are many rivers in the country, the three main ones being (west to east) the Essequibo, the Demerara, and the Berbice. There is also the Corentyne along the border with Suriname. At the mouth of the Essequibo are several large islands. The local climate is tropical and generally hot and humid, though moderated by northeast trade winds along the coast. There are two rainy seasons, the first from May to mid-August, the second from mid-November to mid-January. Guyana was in a border dispute with both Suriname, which claimed the land east of the Corentyne River in southeastern Guyana, and Venezuela, which claims the land west of the Essequibo River as part of Guayana Esequiba. The dispute with Suriname was arbitrated by the United Nations Convention on Law of the Sea, and a ruling in favor of Guyana was announced in September 2007. When the British surveyed British Guiana in 1840, they included the entire Cuyuni River basin within the colony. Venezuela did not agree with this, as it claimed all lands west of the Essequibo River. In 1898, at Venezuela's request, an international arbitration tribunal was convened, which in 1899 issued an award giving about 94 percent of the disputed territory to British Guiana. Venezuela and Great Britain accepted the award by treaty in 1905. In 1962, Venezuela renewed its nineteenth-century claim, alleging that the arbitration award was invalid. The British and Guyanese rejected this renewed claim, and efforts by all the parties to resolve the matter on the eve of Guyana's independence in 1966 failed. On February 17, 1966, in Geneva, the parties agreed in principle to settle the dispute peacefully, but no other agreement was reached. Later in 1966, Venezuela occupied and annexed the Guyanese half of Ankoko Island in the Cuyuni River. On June 18, 1970, at the Port of Spain meetings of the Caribbean nations, Venezuela and Guyana signed a protocol placing a moratorium on discussions on the border issue for a period of 12 years. The moratorium expired and was not renewed. The only current agreement recognized by both sides is a semi-official agreement between the Guyanese Defense Force and the Venezuelan army signed in 1990. Venezuelan maps after 1962 started to show the territory as disputed or labeled it Zona en Reclamación (the "zone to be reclaimed"). After 1982, Venezuelan maps began to show Guayana Esequiba as an integral part of Venezuela without any indication that it was under Guyanese administration and in dispute. On November 15, 2007, a contingent of Venezuelan armed forces entered Guyana’s territory and destroyed two dredgers at a gold mine. That was followed by unauthorized overflights by two Venezuelan helicopters. Guyana protested the Venezuelan action and is seeking a diplomatic resolution of the issue. Caracas said the action was against illegal gold miners and was part of a program to strengthen security on Venezuelan borders. Guyana abounds with plant and animal life. Each region boasts unique species. The following habitats have been categorized: coastal, marine, littoral, estuarine palustrine, mangrove, riverine, lacustrine, swamp, savanna, white sand forest, brown sand forest, montane, cloud forest, moist lowland and dry evergreen scrub forests. About 14 areas of biological interest have been identified as possible hotspots for a National Protected Area System. More than 80 percent of Guyana is still covered by forests, ranging from dry evergreen and seasonal forests to montane and lowland evergreen rainforests. These forests are home to more than a thousand species of trees. Guyana's tropical climate, unique geology, and relatively pristine ecosystems support extensive natural habitats with high levels of endemism. Approximately 8,000 species of plants occur in Guyana, half of which are found nowhere else. Guyana has one of the highest rates of biodiversity in the world, with 1,168 vertebrate species and 800 bird species. Four of the world's eight species of sea turtles come to Shell Beach on the northwestern coast to lay their eggs. The Guiana Shield region is little known and extremely rich biologically. Unlike other areas of South America, over 70 percent of the natural habitat remains pristine. The rich natural history of British Guiana was described by early explorers Sir Walter Raleigh and Charles Waterton and later by naturalists Sir David Attenborough and Gerald Durrell. Guyana signed the Convention Concerning the Protection of the World Cultural and Natural Heritage in 1977. In the 1990s, Guyana began selecting sites for World Heritage nomination. The three sites considered were Kaieteur National Park, Shell Beach, and Historic Georgetown. 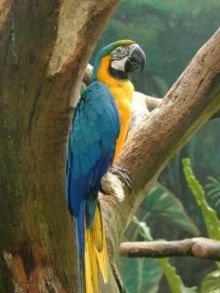 Guyana exhibits two of the World Wildlife Fund's Global 200 ecoregions most crucial to the conservation of global biodiversity and is home to several endemic species, including the tropical hardwood Greenheart (Chlorocardium rodiei). When the first Europeans arrived in the area around 1500, Guyana was inhabited by the Arawak and Carib tribes of American Indians. Although Guyana was first sighted by Christopher Columbus during his third voyage (in 1498), it was not settled by Europeans until the Dutch in 1616, who established three separate colonies: Essequibo (1616), Berbice (1627), and Demerara (1752), and started sugar plantations. Soon the region was producing coffee, cotton, and cocoa as well. The British assumed control in the late eighteenth century, and the Dutch formally ceded the area in 1814. In 1831 the three separate colonies became a single British colony known as British Guiana. 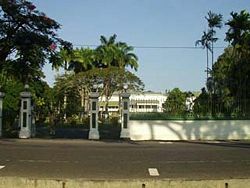 The "Old Residence," a relic of colonial times. Escaped slaves formed their own settlements known as Maroon communities, but with the abolition of slavery in 1834 many of the former slaves began to settle in urban areas. Indentured laborers from modern-day Portugal (1834), Germany (first in 1835), Ireland (1836), Scotland (1837), Malta (1839), China, and India (beginning in 1838) were imported to work on the sugar plantations. In 1889, Venezuela claimed the land up to the Essequibo. Ten years later an international tribunal ruled the land belonged to British Guiana. In 1928, British Guiana was made a crown colony, a move that reasserted British control at a time when political and labor unrest was rising. Finally, in the 1950s the constitution was revised and general elections held. Dr. Cheddi Jagan and Forbes Burnham formed the People's Progressive Party (PPP), which won the elections. Jagan's radical reforms as prime minister concerned the British, who suspended the constitution until 1957. Burnham split from the PPP and formed the People's National Congress (PNC), supported primarily by Afro-Guianese. The United States and United Kingdom feared that Jagan would create "another Cuba" in the Western Hemisphere if the colony were granted independence with Jagan in power and thus promoted political changes that favored the PNC. Guyana achieved independence from the United Kingdom, in 1966, and became a republic on February 23, 1970, though remaining a member of the Commonwealth. Burnham became the first prime minister and moved Guyana toward socialism, including nationalizing foreign companies that dominated the bauxite and sugar industries. Guyana became aligned with the Soviet Union, and Burnham restricted press freedom and revised the constitution to stay in power. Upon his death in 1985, he was succeeded by Hugh Desmond Hoyte, who realigned Guyana with the United States and instituted economic reforms to encourage investment. In 1992, Jagan's PPP won the elections in free and fair elections but continued efforts to revive the economy. Amid political fighting after Jagan died in 1997, the PPP and PNC agreed on terms of a peace deal. Bharrat Jagdeo of the PPP became president and was elected president in 2001 and 2006. Legislative power rests in a unicameral National Assembly, with 40 members chosen on the basis of proportional representation from national lists named by the political parties. An additional 25 members are elected by regional administrative districts. The legislature is not directly elected; each party presents slates of candidates for the National Assembly. After the election, each party leader selects from the party lists the individuals who will represent the party in the National Assembly. The president may dissolve the assembly and call new elections at any time, but no later than five years from its first sitting. Executive authority is exercised by the president, who appoints and supervises the prime minister and other ministers. The president is not directly elected; each party presenting a slate of candidates for the assembly must designate in advance a leader who will become president if that party receives the largest number of votes. Any dissolution of the assembly and election of a new assembly can lead to a change in the assembly majority and consequently a change in the presidency. Most cabinet ministers must be members of the National Assembly; the constitution limits non-member “technocrat” ministers to five. Technocrat ministers serve as non-elected members of the National Assembly, which permits them to debate but not to vote. The judiciary is independent of the executive and the legislature. The highest judicial body is the Court of Appeal. The second level is the High Court. The 2006 national elections were the first peaceful elections in recent memory; they were deemed free and fair. Historically, politics is a source of tension in the country and violent riots have often broken out during elections. During the 1970s and 1980s, the political landscape was dominated by the People's National Congress (largely African). Since 1992, the People's Progressive Party (supported by East Indians) has led the country. The two parties are principally organized along ethnic lines and as a result often clash on issues of governance. Guyana is divided into ten regions, each headed by a chairman who presides over a regional democratic council. The regions are divided into 27 neighborhood councils. Local communities are administered by village or city councils. The most significant reported human rights abuses in 2006 included unlawful killings by police, police abuse of suspects, poor prison and jail conditions, lengthy pretrial detention, and warrantless searches. Inequitable use of government-controlled media resources compromised media freedom during the campaign for the August 2006 elections. There was a widespread perception of government corruption. Sexual abuse and domestic violence against women and children and discrimination against indigenous persons were pervasive; trafficking in persons remained a problem. Tractor in a rice field on Guyana's coastal plain. Until recently, the government was juggling a sizable external debt against the urgent need for expanded public investment. Low prices for key mining and agricultural commodities combined with troubles in the bauxite and sugar industries had threatened the government's tenuous fiscal position and dimmed prospects for the future. 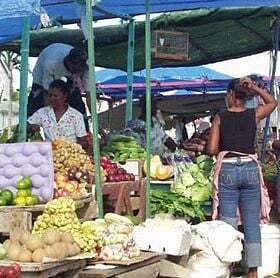 However, the Guyanese economy has rebounded slightly and exhibited moderate economic growth since 1999, based on an expansion in the agricultural and mining sectors, a more favorable atmosphere for business initiatives, a more realistic exchange rate, fairly low inflation, and the continued support of international organizations. Chronic problems include a shortage of skilled labor and a deficient infrastructure. The main economic activities in Guyana are agriculture (producing rice and sugar), bauxite mining, gold mining, timber, shrimp fishing, and minerals. The sugar industry, which accounts for 28 percent of all export earnings, is largely run by Guysuco, which employs more people than any other industry. Many industries have a large foreign investment. The mineral industry, for example, is heavily invested in by the American company Reynolds Metals and the Canadian Alcan. Russia took control of a major part of the bauxite industry in March 2006, when the Rusal company bought 90 percent of the Aroaima Mining Co. in Berbice. The Guyanese government retained the other 10 percent. Rusal later announced that it was also interested in buying into Guyana's other big bauxite producer, Omai. The Korean/Malaysian Barama Company has a large stake in the logging industry. A section of Bourda Market. The production of balatá (natural latex) was once big business in Guyana. Most of the balata bleeding in Guyana took place in the foothills of the Kanuku Mountains in the Rupununi. Folk uses of balatá included the making of homegrown cricket balls, the temporary filling of troublesome tooth cavities, and the crafting of figurines and other decorative items (particularly by the Macushi people). The government initiated a major overhaul of the tax code in 2007. A Value Added Tax (VAT) replaced six different taxes, making it harder to evade paying taxes and easier for government auditors to spot embezzlement. While the adjustment to VAT has been a tough one, it may improve day-to-day life because of the significant additional funds the government will have available for public spending. President Bharrat Jagdeo has made debt relief a priority. He has been quite successful, getting US $800 million of debt written off by the International Monetary Fund, the World Bank, and the Inter-American Development Bank, in addition to millions more from other industrialized nations. 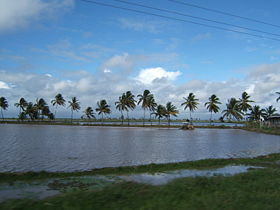 The rice and sugar industries performed well in 2006. Rice export earnings, for example, rose 20 percent from $46.2 million in 2005 to $54.6 million in 2006. Sugar, too, saw a strong climb in earnings from $118 million in 2005 to $145 million in 2006. There are dim hopes for the sugar industry in the near future, however. A new European Union arrangement signed in 2007 gradually phases out long-standing preferential treatment for Guyana sugar exports over three years. Prices for sugar are expected to drop significantly, reducing income from the commodity by as much as 30 percent in the coming years. Over the past two years the forestry and fisheries sector have recorded strong performance, contributing 15-20 percent to export earnings. Forestry, in particular, is viewed as a strong income opportunity for the country. The industry is under increased scrutiny as questions are raised over the management and enforcement of contracts for its forestry concessions. The government is considering calls to ban the raw export of certain types of logs in favor of value-added export opportunities that will bring in more foreign exchange. The stagnant mining sector recorded minimal growth in 2006. Bauxite export earnings rose to U.S. $67 million in 2006, a slight increase over 2005. Gold export earnings experienced a similar increase, reaching $114.4 million in 2006 compared to U.S. $111 million in 2005. The engineering and construction sectors recorded 12 percent growth in 2006. Most of this was driven by new hotel construction in the buildup to Guyana’s hosting of the Cricket World Cup in March 2007. New housing projects also spurred the sector forward. Guyana's extremely high debt burden to foreign creditors has meant limited availability of foreign exchange and reduced capacity to import necessary raw materials, spare parts, and equipment, thereby further reducing production. The increase in global fuel costs also contributed to the country’s decline in production and growing trade deficit. The decline of production has increased unemployment. Although no reliable statistics exist, combined unemployment and underemployment are estimated at about 30 percent. Emigration, principally to the United States and Canada, remains substantial. After years of a state-dominated economy, the mechanisms for private investment, domestic or foreign, are still evolving. The shift from a state-controlled economy to a primarily free market system began under Desmond Hoyte and continued under successor PPP governments. The current administration recognizes the need for foreign investment to create jobs, enhance technical capabilities, and generate goods for export. The population of Guyana is racially and ethnically heterogeneous, composed chiefly of the descendants of immigrants who came to the country either as slaves or as indentured laborers. The population therefore comprises groups of persons with nationality backgrounds from Europe (United Kingdom and Portugal), Africa, China, and India, with the Amerindians as the indigenous population. The majority live in Georgetown, the capital; in two or three other towns, and along the coast. Large areas of mountains, savanna, and rainforest are uninhabited. Languages spoken are English, Amerindian dialects, Creole, Caribbean Hindustani (a dialect of Hindi), and Urdu. The largest nationality sub-group is that of the East Indians, comprising 50 percent of the population in 2007. They are followed by persons of African heritage (36 percent). The third in rank are Amerindians with 7 percent; whites, Chinese, and mixed are 7 percent. In an effort to combat the spread of HIV/AIDS in Guyana, the U.S. Centers for Disease Control and Prevention (CDC), in coordination with the U.S. Agency for International Development (USAID), is administering a five-year multimillion dollar program of education, prevention, and treatment for those infected and affected by the disease. Guyana, along with Suriname, French Guiana, and Brazil, is one of the four non-Hispanic nations in South America. Guyana's culture is very similar to that of the English-speaking Caribbean, to the extent that Guyana is included and accepted as a Caribbean nation and is a founder member of the CARICOM (Caribbean Community) economic bloc and also the home of the bloc's headquarters. Nevertheless, its geographical location, its sparsely populated rainforest regions, and its substantial Amerindian population differentiate it from English-speaking Caribbean countries. Its blend of East Indian (Asian Indian) and West Indian (black) cultures gives it similarities to Trinidad and distinguishes it from other parts of the Americas. Guyana shares similar interests with the islands in the West Indies, such as food, festive events, music, sports, and so on. Guyana plays international cricket as a part of the West Indies cricket team, and the Guyana team plays first-class cricket against other nations of the Caribbean. Guyana is a member of CONCACAF, the international football federation for North and Central America and the Caribbean. Another aspect of Guyanese culture is its rich folklore about Jumbees. 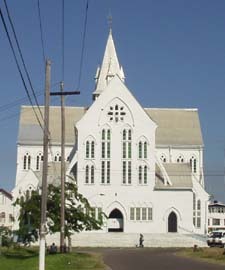 The major religions in Guyana include Christianity (41.6 percent), Hinduism (28.8 percent), Islam (7.3 percent), Rastafarian (0.5 percent), and Bahá'í (0.1 percent), with the remainder being of no faith or indigenous religions. Most Guyanese Christians are Protestants and include a mix of all races. Hinduism is dominated by the Indians who came to the country in the early 1800s, while Islam varies between Afro-Guyanese and Indian-Guyanese. Guyana's educational system, which at one time was considered among the best in the Caribbean, deteriorated in the 1980s because of the emigration of highly educated citizens and the lack of appropriate funding. Although it recovered somewhat in the 1990s, it still does not produce the quality of educated students necessary for Guyana to modernize its workforce. The educational system does not, for example, focus on training in science and technology, technical and vocational subjects, business management, or computer sciences. There are wide disparities among the geographical regions of the country in the availability of quality education, and the physical facilities are in poor condition. Furthermore, many of the better-educated professional teachers have emigrated to other countries over the past two decades, mainly because of low pay, lack of opportunities, and crime. As a result, there is a lack of trained teachers at every level of Guyana's educational system. Guyanese cuisine has many similarities to that of the rest of the Caribbean. The food is diverse and includes dishes such as chicken curry, roti, and cookup rice (a style of rice with different kinds of vegetables accompanied by chicken, beef, or fish). The food reflects the ethnic makeup of the country and its colonial history, and includes dishes from the Africans and creoles, East Indians, Amerindians, Chinese, and Europeans (mostly British and Portuguese). Unique dishes include Pepperpot, made with cassreep (an extract of cassava) and of Amerindian origin. There is also Metemgie, a thick rich soup with a coconut base filled with ground provisions, and big fluffy dumplings, traditionally eaten with fried fish, or, more recently, chicken. Most Guyanese love the Caribbean-style Chinese food sold in restaurants in the bigger towns. A favorite is Chicken in the ruff, which is fried rice with Chinese-style fried chicken on top. There is an abundance of fresh fruits, vegetables, and seafood on the coast. Most people use fresh fruit to make their own beverages, which are called "local drink." Fresh fish and seafood are an integral part of the food of the rural areas and small villages along the coast. The crab soups and soups with okra from the Berbice coastal region resemble that of the Louisiana creole soups like gumbo. Homemade bread-making is an art in many villages, a reflection of the British influence, and includes pastries such as cheese roll, pine (pineapple) tart, and patties (sister to the Jamaican beef patty). 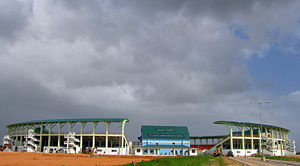 The major sports in Guyana are cricket (Guyana is part of the West Indies for international cricket purposes), softball cricket (beach cricket), and football. Minor sports are netball, rounders, lawn tennis, basketball, table tennis, boxing, squash, and a few others. Guyana played host to international cricket matches as part of the 2007 Cricket World Cup. A brand-new 15,000-seat stadium, Providence Stadium, was built in time for the World Cup. 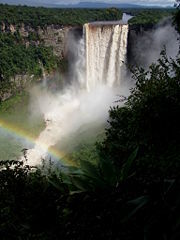 ↑ 1.0 1.1 The World Factbook: Guyana. CIA. Retrieved July 21, 2017. ↑ 2012 Population & Housing Census. Retrieved July 21, 2017. ↑ 3.0 3.1 3.2 3.3 Guyana. International Monetary Fund. Retrieved July 21, 2017. Abrams, Ovid. Metegee the History and Culture of Guyana. Queens Village, NY: Ashanti Books, 1997. ISBN 0966070747. Bacon, Margaret. Journey to Guyana. London: Dobson, 1970. ISBN 0234773383. Bacchus, Noël Compton. Guyana Farewell a Recollection of Childhood in a Faraway Place. New York: N. Bacchus Pub., 1995. ISBN 0962419214. Brock, Stanley E., and Stanley E. Brock. All the Cowboys Were Indians. Lenoir City, TN: Synergy South, Inc., 1999. ISBN 189232900X. Colchester, Marcus. Guyana, Fragile Frontier Loggers, Miners, and Forest Peoples. Kingston, Jamaica: Ian Randle Publishers, 1997. ISBN 9768123222. Daly, Vere T. The Making of Guyana. London: Macmillan, 1974. ISBN 0333144821. Haack, Donald. Bush Pilot in Diamond Country. Charlotte, NC: Pure Heart Press, 2004. ISBN 1930907494. Henfrey, Colin. Through Indian Eyes; A Journey Among the Indian Tribes of Guiana. New York: Holt, Rinehart and Winston, 1965. MacInnes, Hamish. Climb to the Lost World. London: Hodder and Stoughton, 1974. ISBN 0340190418. Morrison, Andrew. Justice the Struggle for Democracy in Guyana, 1952-1992. Guyana: s.n., 1998. ISBN 9768157526. Morrison, Marion. Guyana. Enchantment of the World. New York: Children's Press, 2003. ISBN 0516223771. Rabe, Stephen G. U.S. Intervention in British Guiana a Cold War Story. (The New Cold War history.) Chapel Hill, NC: University of North Carolina Press, 2005. ISBN 080782979X. Salkey, Andrew. Georgetown Journal a Caribbean Writer's Journey from London via Port of Spain to Georgetown, Guyana, 1970. London: New Beacon Books, 1972. ISBN 090124113X. Temple, Bob. Guyana. Discovering South America. Philadelphia, PA: Mason Crest Publishers, 2004. ISBN 1590843002. All links retrieved July 21, 2017. Background Notes: Guyana U.S. State Department. This page was last modified on 31 July 2017, at 15:20.